University of Notre Dame computer science and engineering professor Peter Kogge, developer of the space shuttle I/O processor, the world’s first multicore processor, and a number of other important innovations has been named the recipient of the IEEE Computer Society’s 2012 Seymour Cray Computer Engineering Award. Kogge, the Ted H. McCourtney Professor of Computer Science and Engineering at Notre Dame since 1994, was recognized “for innovations in advanced computer architecture and systems.” The Seymour Cray Award is one of the IEEE Computer Society’s highest awards, and is presented in recognition of innovative contributions to high-performance computing systems that best exemplify Cray’s creative spirit. The award consists of a crystal memento, a certificate and a $10,000 honorarium. Kogge has been at the forefront of several innovations that have shaped the computing industry over the past three decades. While working on his Ph.D. at Stanford University in the 1970s, he invented the Kogge-Stone adder process, what is still considered the fastest way of adding numbers in a computer. During his 26-year career at IBM, Kogge, an IBM Fellow, designed the space shuttle I/O processor, one of the first multithreaded computers and the first to fly in space. Kogge was also inventor of the world’s first multicore processor, EXECUBE, which he and his IBM team placed on a memory chip in an early effort to solve the data bottleneck problem. Co-inventor on more than three dozen patents, Kogge is also the author of two textbooks, including the first textbook on pipelining, a now ubiquitous technique for executing multiple instructions in a computer in parallel. More recently, Kogge led a team of computer professionals for the U.S. Defense Advanced Research Projects Agency to explore development of a supercomputer capable of executing a quintillion mathematical operations per second. 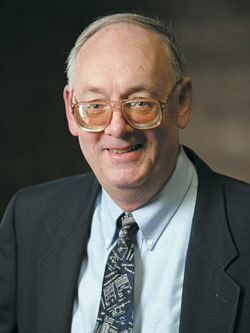 His current research areas include massively parallel processing architectures, advanced VLSI and nanotechnologies and their relationship to computing systems architectures, non-von Neumann models of programming and execution, and parallel algorithms and applications and their impact on computer architecture. Kogge is scheduled to accept the award at the keynote session at SC12 on Nov. 13 (Tuesday) in Salt Lake City. Other previous Cray recipients include Ken Batcher, John Cocke, Glen Culler and William J. Dally. About the IEEE Computer Society: IEEE Computer Society is the world’s leading computing membership organization and the trusted information and career-development source for a global workforce of technology leaders including professors, researchers, software engineers, IT professionals, employers and students. IEEE Computer Society provides a wide range of forums for top minds to come together, including technical conferences, publications and a comprehensive digital library, unique training webinars, professional training and a Corporate Affiliate Program to help organizations increase their staff’s technical knowledge and expertise. Originally published by Notre Dame News at news.nd.edu on October 11, 2012.